Unifor workers at a General Motors plant in Ingersoll, Ont., have ratified a new contract, ending a four-week strike that threatened to pinch sales of the Chevrolet Equinox. Eighty-six per cent of all members, including skilled trades workers, who cast ballots favoured the four-year deal, sending employees back to work at 7 p.m. ET Monday for early startup, according to the union. Full production is set to resume at 11 p.m., Unifor said. Skilled trades workers voted 78.7 per cent in favour of their deal. About 2,800 workers walked off the job at the CAMI Assembly Plant on Sept. 17. Job security was the union’s biggest demand during contract talks. Unifor had demanded the plant be named -- in writing -- the lead producer of the Equinox. That means if GM needs more of the compact crossover, CAMI would be first to get the additional work, but if sales slowed, production would be scaled back first at a pair of plants that also produce the Equinox in Mexico. Unifor Local 88 President Dan Borthwick told Automotive News Canada the new deal does not include such a letter pledging jobs will be maintained at the assembly plant. The contract also lacks promises of new product or new jobs, Borthwick said. Instead, there is what the union considers stronger language surrounding job security. The union said that the contract makes it more costly for GM Canada to close the plant -- about $290 million vs. $190 million in the previous contract. “It’s more of a penalty for the employer to close the plant now. 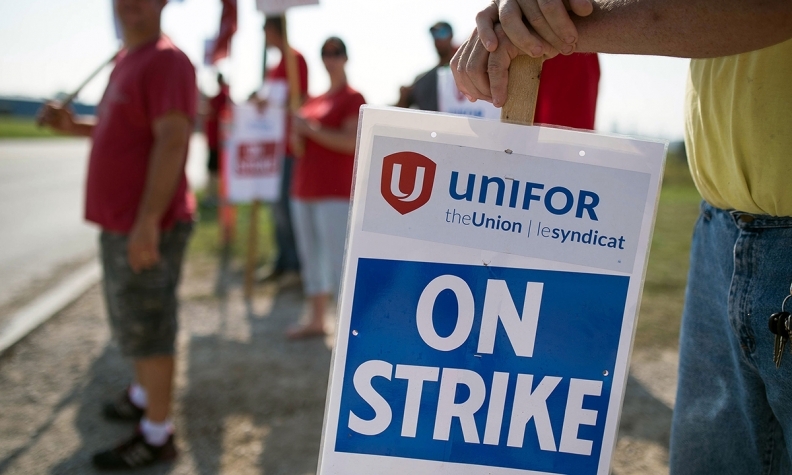 It’s going to cost them $100 million more,” Unifor Local 88 President Dan Borthwick said. Employees that are near early retirement but are forced to leave the plant should GM close it can still grow into a retirement program even if CAMI is shuttered, Borthwick explained. “The end result was not the result we were hoping for, it shows the true colors of GM,” Unifor Local 88 Chair Mike Van Boekel said in a statement to his members. The union also said workers get a four per cent wage hike and $8,000 in lump-sum payments over the four-year life of the proposal. All current employees also get a $6,000 performance bonus. The contract also ensures new hires on the production line reach full wage of $34.15 per hour at an accelerated pace, the union said. "The ratification of a new four-year agreement between GM Canada and Unifor Local 88 at CAMI Assembly is welcome news for our company, employees and the community," Steve Carlisle, president of GM Canada, said in a statement. "We have an outstanding new product at CAMI with the Chevrolet Equinox and I am confident that we will quickly pull together to continue to demonstrate to the world the outstanding productivity, innovation and quality that is synonymous with the CAMI workforce..."
"The employees at CAMI have created a culture of team involvement and continuous improvement resulting in numerous industry awards for vehicle quality and productivity. I am confident that by working as one team, that will continue for years to come." The automaker threatened last week to shift more production to Mexico if a new contract wasn't reached soon.